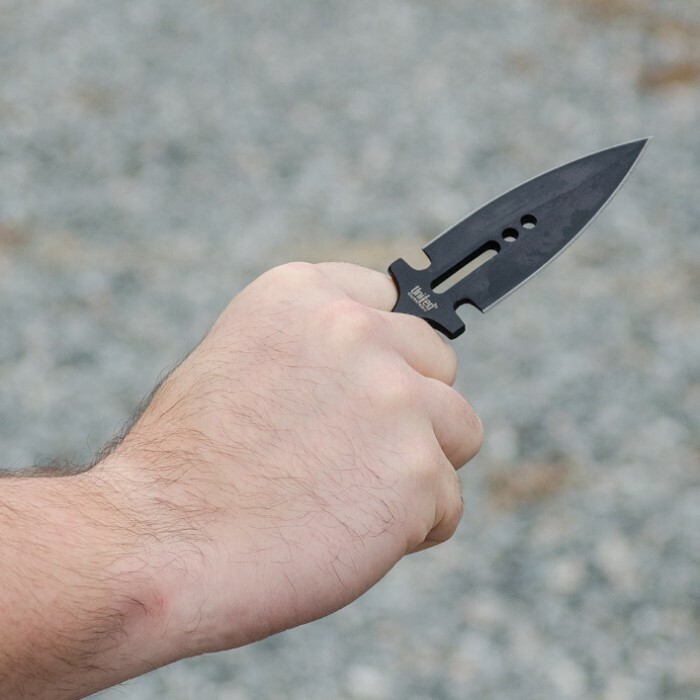 This Magnum Black Push Dagger is constructed from one solid piece of 420 stainless steel with double edge styling and contoured grips for pure thrusting power. Includes a heavy-duty nylon sheath. 5 5/8" overall, 3 1/4" blade. The rating is not necessarily for quality, but for practicality. I can carry two of these in one large 5 inch lockback sheath. Touch up the edge and it is ready to go. For last ditch defense, two knives are better than one. Nice little Push Dagger. Make sure you know the laws in your area. Something like this can fall into a law that considers "Implied Use". Other laws affect Push Daggers so know them. I got this a while back along with the little doubles. This is very nice, not very sharp on the edges, but nice point and suppose it can be lashed to a stick for a makeshift spear. I was just wrapping the handle a bit today because it lacks stability in the hand (I have small hands, so it might be worse in larger hands). I am writing in case others are thinking about getting these, wrapping them so they don't have to pay more for the ones that have thick handles. I only got a few wraps of hockey tape before I realized the strap of the sheath wouldn't snap if there was too much "thickness" added to the handle. Without that strap, the knife will fall right out, so you need it to snap or go with another sheath option. You could also do just the wings of the handle so the strap easily goes down the center. Just a FYI. Great little blade. Know your laws - don't let a minor traffic stop or security search get you into much hotter water. Ignorance of the law doesn't work. I will be going to the Honshu line of these because of the better handles. Cold Steel - way too expensive. I just got my shipment today and it seems like a good dagger. My only complaint is the sheath- the snap holding it in is somewhat inconveniently placed. I think it would be more easily accessible if the band holding it in were at the bolster. Good quality, and easy use of the knife though. Great piece united cutlery did not fail me. Great steel quality and easily concealed. All around great knife. I LOVE this knife, real comfortable to hold and super sharp. Holder is made really well too, and will fit snuggly on most belts. The blade is of outstanding quality. Fits securely in my hand and in its sheath. An all around great product, both sheath and knife. Not the best quality steel, to be sure. But for the price, 420 is quite alright! 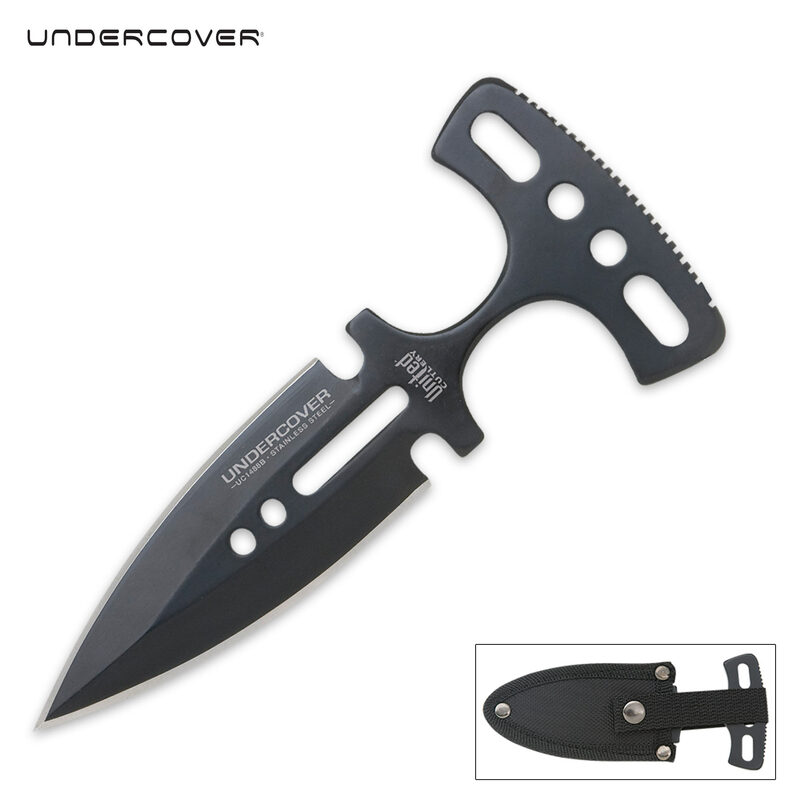 The Cold Steel push daggers have better steel, but expect to pay 3-4 times as much as you will for this little beauty.